Congressional investigators say the former Trump strategist sought research on Putin during the 2016 campaign. 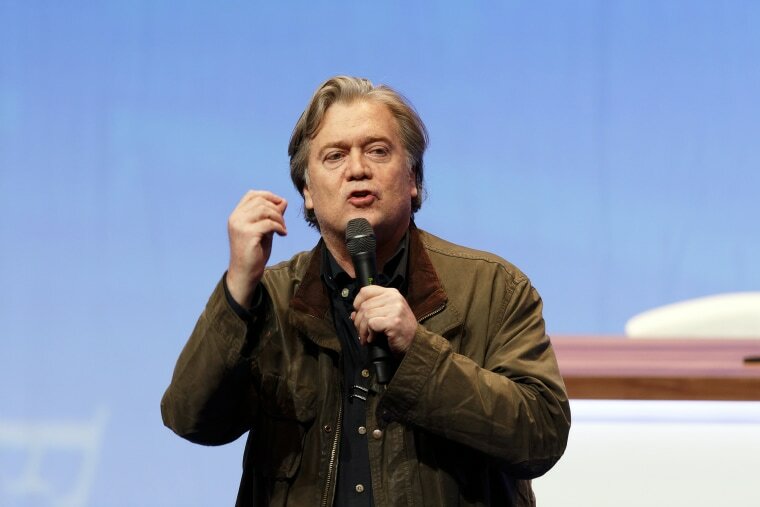 WASHINGTON — Cambridge Analytica whistleblower Christopher Wylie told Democrats on Capitol Hill that former Trump campaign strategist Steve Bannon asked the embattled data firm to study voter suppression strategies as the group also conducted test messaging on Russia. In a closed-door meeting Tuesday, Wylie told Democratic Members of the House Judiciary Committee and the House Committee on Oversight and Government Reform that Bannon specifically tasked Cambridge Analytica with looking at ways to depress Democratic turnout with their messaging. Cambridge Analytica “was set up to be essentially a full service propaganda machine,” Wylie said. He spoke to Democrats on the House Intelligence Committee in separate closed-door meeting Tuesday. Bannon acknowledged helping to found Cambridge Analytica and coming up with the company’s name at a Financial Times conference in March. “I helped put the company together and gave it that amazing name,” Bannon told the conference. But, he said he “didn’t even know about the Facebook mining,” referring to the scandal surrounding data on up to 87 million Facebook users that was improperly sold to Cambridge Analytica to help the company develop messaging for Republican candidates in U.S. elections. The company was later hired by Donald Trump’s campaign. Bannon did not respond to a request for comment on this story. According to House Judiciary Committee Democrats, Wylie also told lawmakers Cambridge Analytica tested messaging for an American audience about Vladimir Putin and Russian expansion in Eastern Europe. But based on a transcript of his comments provided by the committee, it was not clear to Wylie whether Bannon directed the research. Wylie said there was very little U.S.-based staff at Cambridge Analytica. The company, he said, was a “shell” company with most of the work done in London by its parent company, SCL. Lawmakers asked Wylie about Michael Flynn’s advisory role in the company. Flynn did not disclose his relationship with Cambridge Analytica until he filed his third amended financial disclosure form, which listed work for the SCL Group, but stated that he worked for them only from November 2016 to December 2016. “As far as I know, it was to open doors and look at potential contracts,” Wylie said of the relationship. Wylie has publicly stated his suspicions about Cambridge Analytica’s work with Russia but the company has denied ever doing any work with any Russian entity. A spokesman for Cambridge Analytica and SCL did not respond to requests for comment. In the Financial Times video Bannon defends the company, saying it only works in U.S. elections and is totally separate from its parent company, SCL, that has been criticized for some of its work in elections around the world. Bannon and Cambridge Analytica’s financial backers Rebekah and Robert Mercer got legal advice about the importance of having Cambridge Analytica be a U.S. company with Americans in leadership and decision-making roles if working on U.S. elections. Cambridge Analytica has called Wylie a disgruntled former contractor who left the company in July 2014 and has no knowledge of the inner workings of the company.